I’d like to get back to the idea of how to reuse potential of social networks in organization. In the past, I discussed about how to use micro-blogging for collaboration in an engineering organization. One of the questions came after was how to collaborate with right people in organization. In this context, I’d like to share with you some interesting results based on a collaboration profile I created using product Mailana. This particular profile was generated based on my twitter network and allows me to explore my contacts in the net. 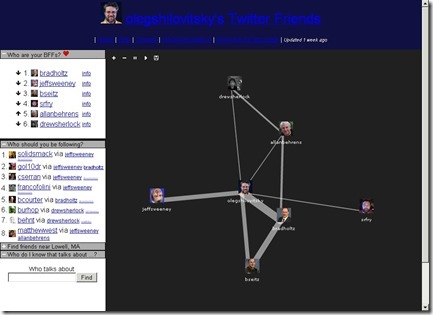 So, you can see who your peers are and how you communicate with them, i.e. frequency of messages, topics for collaboration etc. I think that this user experience has a great potential to improve the way we collaborate inside of the PLM system around product development. This type of tool allows us to focus our collaboration around a specific person and see contextually all topics we need to discuss with this person. Today most of our collaborative scenarios follow around tasks (i.e. ECO). In this situation, we come to a particular topic first and need to discover the right people with whom to collaborate or discuss about the particular task. But this is not always the best way to work – people are not always available and you jump between topics basically based on people availability. My idea is how can we manage our collaboration around people? The scenario of collaboration can be changed and improved to start the collaboration from a person. At the time you start to collaborate with that person, you can see the summary of all topics related to the person and you can improve the way you work with him or her. Simply put, when you speak to your colleague or manager, you will have a summary of all open issues / designs / ECO. So, people will become the focal point for collaboration.